Before announcing his retirement from the U.S. Supreme Court, Justice Anthony Kennedy cast the tie-breaking vote in one final, consequential case. 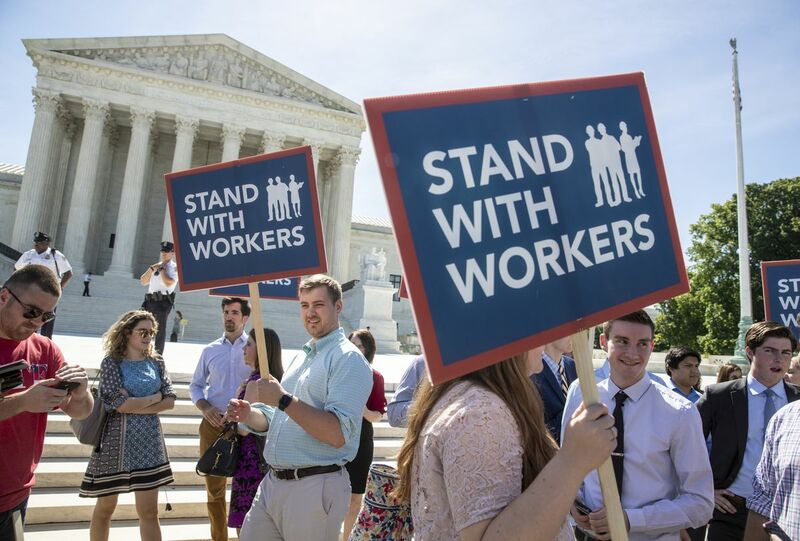 Janus v. American Federation of State, County, and Municipal Employees, Council 31, known colloquially as the Janus case, debated the constitutionality of mandating public sector employees to pay union dues or "agency fees" for bargaining representation and political advocacy. On June 27, the court ruled in a 5-4 vote that such a mandate is unconstitutional. The Janus decision is a major one, upending four decades of precedent on union law. Now, public sector employee participation in unions — whether paying full dues or "agency fees" meant to cover the cost of bargaining but not political advocacy — will be not only voluntary but opt-in. That is, employees will have to proactively opt to join the union if they wish to contribute to it. The decision is good law. Compulsory union membership, including the required financial contributions, violate basic principles of liberty and self-determination. Workers shouldn't be forced to support political causes or belong to groups that they disagree with. There's no question that this decision is a blow to the power of public sector unions. Some percentage of public employees, whether because they feel poorly represented by the union, because they disagree with its political advocacy or simply because they don't want the money deducted from their paychecks, will surely choose not to remain members. With less money and fewer members, unions' ability to engage in advocacy will be curtailed. Alaska will be one of the states most affected by the Janus decision. Our state has the second-most state and municipal employees per capita — 392 out of every 10,000 residents. Nearly half are teachers — almost 20,000 of the state's 54,435 public sector employees as of 2014, according to the U.S. Census Bureau. But even for the unions themselves, there's little point in bemoaning the decision. The makeup of the court is unlikely to shift in a way that would make its justices more amenable to a reversal; if anything, the court is likely to become more conservative upon the confirmation of Justice Kennedy's replacement. With that in mind, the more beneficial tack for unions to take in the wake of the decision is to convince their members that keeping their representation is worthwhile. It would be foolish to believe that every current public sector employee will remain a union member. Some aren't apt to support the unions' political advocacy; others may not be convinced of the value of union representation in negotiations. But people are rational when their own livelihoods are on the line; if unions demonstrate their value by negotiating well for their members, employees — a sizeable majority, at least — will reward that diligence and pay for that service. In effect, public sector employees will now be customers of unions, with a choice in whether or not to subscribe. Having to convince members of the organization's worth will keep union leadership agile and responsive to member concerns, and it will discourage complacency. Public sector union leaders across the state appear to understand this. "We as a union will be stronger because the members will realize how important we are and the union leadership will no longer take membership for granted," said Abel Bult-Ito of United Academics, a union representing about 1,200 University of Alaska employees, in an interview with Juneau radio station KTOO. Gov. Bill Walker said he opposed the decision and said it created an obstacle for public-sector employees speaking with a unified voice. "But," the governor said in a statement released after the decision, "I am confident that public employee unions will remain the backbone of our state for the foreseeable future." The Janus decision is an important, positive landmark in the push-pull of U.S. labor relations. It won't mean the death of public sector unions. And that will be especially true if those unions can convince members of their value. If greater responsiveness to workers' concerns is the legacy of the Janus decision, it's hard to see that as a negative.